What if not all participants show up? 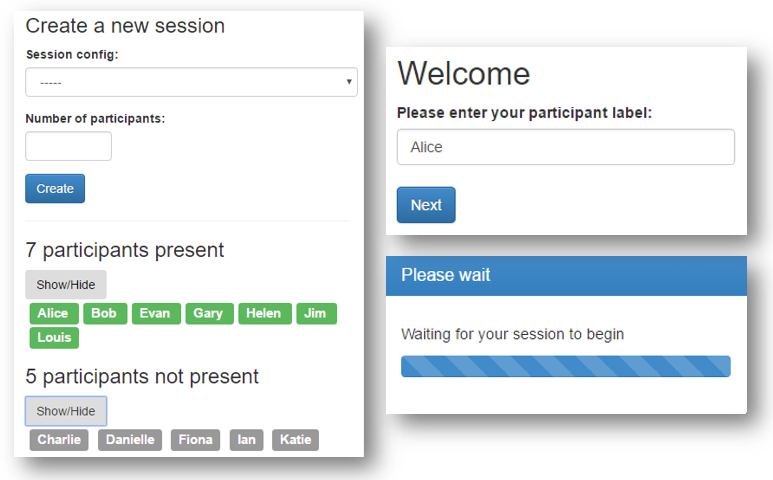 A “waiting room” that lets you see how many people are waiting to start a session, so that you can create a session with the right number of people. Also, you can see a listing of who specifically is waiting, and who has not joined yet. Short links that are easy for participants to type, good for quick live demos. You can create multiple rooms – say, for for different classes you teach, or different labs you manage. To create a room, add to your settings.py a setting ROOMS (and, optionally, ROOM_DEFAULTS). ROOMS should be a list of dictionaries; each dictionary defines the configuration of a room. ROOM_DEFAULTS is a dict that defines settings to be inherited by all rooms unless explicitly overridden (works in an analogous way to SESSION_CONFIG_DEFAULTS). The internal name and display name, respectively. If you omit participant_label_file, then anyone can join as long as they know the room-wide URL. See If you don’t have a participant_label_file. So, even if someone can guess another participant’s participant_label, they won’t be able to open that person’s start URL without the secret hash code. In the admin interface, click “Rooms” in the header bar, and click the room you created. Scroll down to the section with the participant URLs. Have each participant open the URLs. Then, in the room’s admin page, check how many people are present, and create a session for that number of people. You can either use the room-wide URL, or the participant-specific URLs. The participant-specific URLs already contain the participant label, so as soon as they are clicked, the participant will go straight to the waiting page. For example, one participant can open URL http://localhost:8000/room/econ101/?participant_label=Student1, and another participant can open URL http://localhost:8000/room/econ101/?participant_label=Student2. For example, if a participant enters their label as Student1, oTree simply appends the participant label to the room-wide URL, e.g., http://localhost:8000/room/econ101/?participant_label=Student1, checks if the label is contained in the participant label file, and if so, redirects the participant to the wait page. Some language translations are currently missing, in which case it will be shown in English. You can fix that by contributing a translation here. Starting is simple; just have each participant open the room-wide URL. Have each participant open the URLs. Then, in the room’s admin page, check how many people are present, and create a session for that number of people. Although this option is simple, it is less reliable than using participant labels, because someone could play twice by opening the URL in 2 different browsers. Room URLs are designed to be reused across sessions. In a lab, you can set the room URL (either room-wide or participant-specific) as the browser’s home page. In classroom experiments, you can give each student the room-wide URL they can use repeatedly during the semester. If you’re doing a lab experiment and the number of participants is unpredictable, you can consider using the room-wide URL, and asking participants to manually enter their participant label when they sit down at their computer. That way, computers will only be counted as “active” if a participant is actually present. Computers with no participants will remain on the “Enter participant label” page, and will not be counted as present. Alternatively, you can open each computer’s browser to a participant-specific URLs, but before creating the session, be sure to close the browsers on unattended computers, so they are not included in the session.